Though they may be side-by-side in the same aisle at your home improvement store, they aren't interchangeable. Determine which works better in your project by weighing these key differences. While it’s hard to match the natural beauty of solid wood, it’s an undeniably pricey option. Fortunately, for many projects, the two main substitutes—medium-density fiberboard (MDF) and plywood—are less expensive, yet perform just as well or better than solid wood for a wide range of projects, including furniture, cabinets, shelves, and decorative accents such as wainscoting. 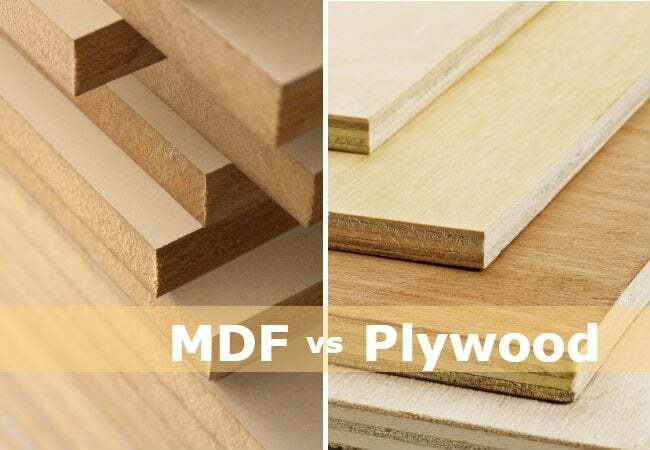 Still, choosing the right material—MDF vs. plywood—for your project can be a puzzle. On the surface, both MDF and plywood contain real wood but are highly engineered into their finished forms. MDF starts off with hardwood and softwood fibers, which are glued together with various resins, and then subjected to high heat and pressure to form panels. Plywood undergoes a similar process, but instead of wood fibers, starts off with very thin layers of wood from peeler logs. At a big-box home improvement store, you’ll find both in sheet forms of different thicknesses and grades—the higher the grade, the higher the price. While they may appear similar, these two popular wood composites are not interchangeable. Both have their strengths and weaknesses based on their construction. To help you decide between them, we’ve addressed their primary differences in the categories that matter most to the average do-it-yourselfer. In general, MDF is cheaper than plywood. While the price depends on the thickness and grade of the material, in general, MDF costs less than plywood. If there are zero other factors pushing you to one material over another, and you’re watching the bottom line, MDF wins the price wars. Plywood looks more like real wood. Since plywood is made with wood strips, its surfaces take on the solid-wood appearance better than MDF. Higher grades of plywood are smooth and quite attractive, with plenty of grain, yet none of the knotholes that can mar solid wood. MDF, in contrast, has no grain, isn’t as smooth as plywood, and looks like what it is: pressed wood fibers. MDF weighs more than plywood. As it’s quite a bit denser than plywood, MDF weighs considerably more. This can be a major issue if you’ll need to lift, hold, or clamp panels in place or construct something that requires an overhead reach, such as elevated shelves. When it comes to strength, plywood is the winner. MDF is a softer material than plywood and tends to sag or split under pressure. That’s why it’s important to reinforce it if you’re going to using it to build shelves or other weight-bearing furniture. Plywood also has more flex than MDF, so you can gently bend it to create curves; plus, plywood won’t expand, contract, or warp, even under temperature extremes. MDF creates more dust when cut. 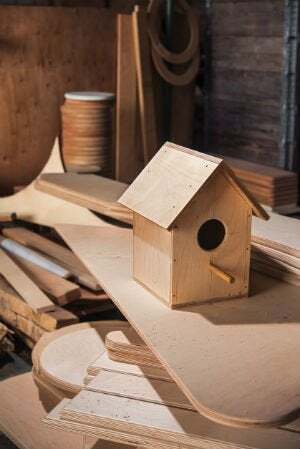 Due to its construction, MDF creates far more sawdust when cut than plywood does, so you’ll need to be extra cautious about working in a well-ventilated area and wearing a respirator or other protective mask and goggles. MDF is easy to cut, even along the edges. Planning to make a piece of furniture, frame, or cabinet door with elaborately scrolled trim? Then you’ll be happiest with MDF. Because of its lack of grain and its softness, MDF is easy to cut and won’t splinter or crack along the edges, even if you carve in curves, sharp angles, or ridges. By contrast, due to its stacked construction, the edges of plywood are rough and not well suited to fancy curves or cuts. Even straight cuts can turn out ragged edges, but our tips for cutting plywood can spare you those imperfections. You’ll need to finish the edges of plywood. Look at the edge of a piece of plywood, and you’ll see the thin layers used to create it. 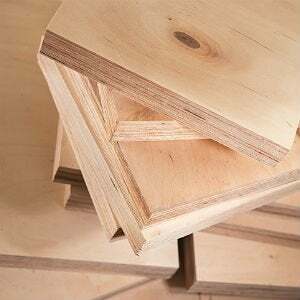 That means you’ll need to finish any exposed edges of your project if it’s made with plywood, usually either with edge banding or molding. This isn’t an issue with MDF, which doesn’t show layers at the edges. MDF takes well to paint, while plywood is great for stains. This is one of the primary questions when weighing MDF vs. plywood: Do you plan on painting the finished project or staining it? MDF, with its smooth surface and lack of grain, takes paint like a champ—although for the best finish, start with a coat of oil-based primer. While you can paint plywood, higher-grade plywood looks great with a stain, due to its solid-wood-like grain and finish. Screws anchor better in plywood. Because it’s soft, MDF doesn’t anchor screws very well. So if your project involves many screws or nails, plywood may be the better choice. 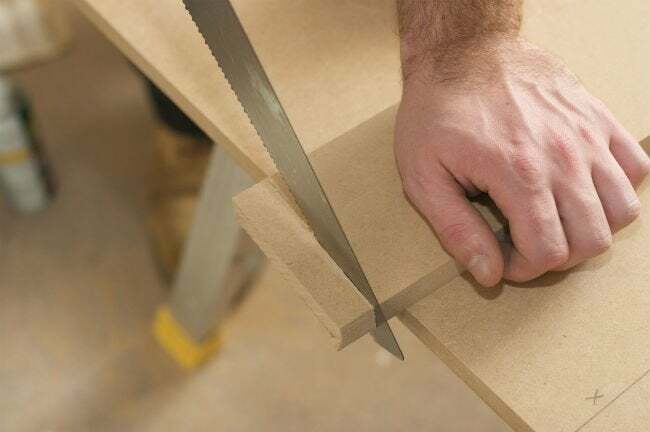 However, if you’ll be screwing or nailing fasteners into the edge of the wood, be aware that plywood is more prone to splintering or splitting at the edges than MDF is. Plywood is the best choice for outdoor projects. If you’re constructing furniture for your yard or planning any type of outdoor project, plywood is the better choice. MDF tends to soak up water far more easily than plywood, then warps and swells once wet. While water can eventually damage plywood, in general, you’ll find that plywood holds up quite well outdoors. Both plywood and MDF tend to emit VOCs and formaldehyde. Both materials off-gas formaldehyde and volatile organic compounds (VOCs), which are lung and nervous system irritants. Formaldehyde-free plywood is available, however, although it’s more expensive than regular plywood. Painting, priming, sealing, or staining the MDF or plywood does help reduce the problem, but will not entirely eliminate it. The bottom line: The type of project will guide your decision, MDF vs. plywood. Plywood and MDF are useful materials for many DIY projects around the home. As a general rule, however, MDF is the better choice for indoor furniture or decorative use, especially if you want to cut intricately carved trim or designs, and plan on painting the finished project. Plywood is excellent for outdoor use, for framing walls or building floors, for crafting kitchen or bathroom cabinets, and for projects that require a curve.